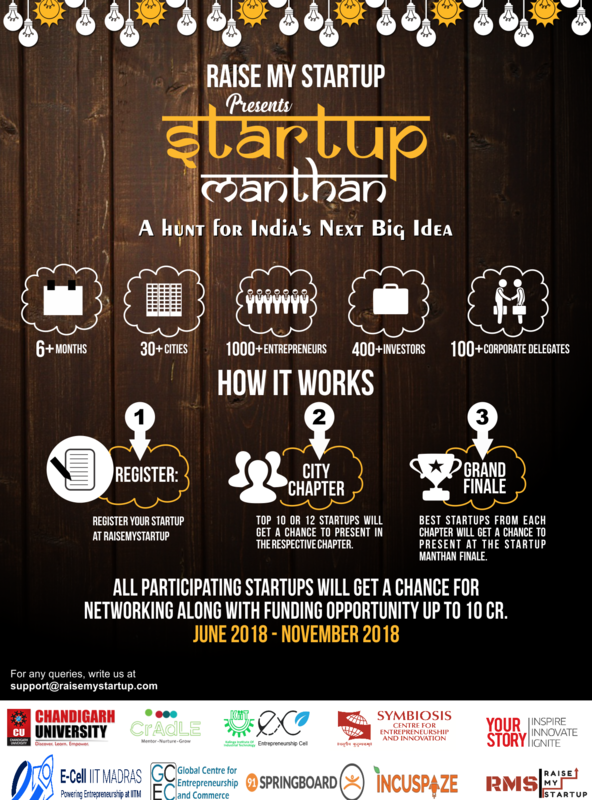 RaiseMyStartup will be organising its first edition of Startup Manthan from June, 2018 to October, 2018 across PAN India.Startup Manthan is a hunt across Pan India with a goal to boost market visibility for the most promising and early-stage startups. It is an unconference designed for early stage entrepreneurs focusing on peer learning from contemporary founders. The format is conducive to creating an informal yet high energy interactive environment, by keeping the main agenda of startups exposure.To facilitate this, we will support Startups in multiple ways and help them to gain visibility from Investors/Mentors, Customers, Media, Influencers and Peers. Happening across 20 cities in India.Span of 6 Months. With expected presence of 1000+ Entrepreneurs and 400+ Investors across Pan India. With look for 3000+ delegate footfall across Pan India. Engagement of Industry bodies, speakers from Startup Ecosystem.